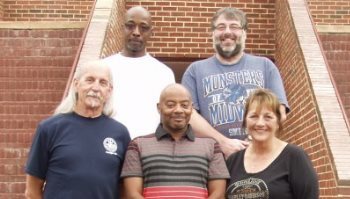 The Negotiating Committee for IAM Local 66 members at Badger Meter completed the Negotiations Preparation for Bargaining Committees program at the Winpisinger Center in Hollywood, MD. Front row from left: Committee Members James Cobb and Andrae Frederick, and District 10 Business Representative Di Ann Fechter. Back row from left: Committee Members Willie Cain and Christopher Brady. The IAM Local 66 Negotiating Committee and staff from District 10, who represent members at Badger Meter, Inc., in Milwaukee, completed the Negotiations Preparation for Bargaining Committees program at the Winpisinger Center. Recognizing that it is likely to be a difficult round of negotiations, the committee strategized to change its bargaining approach and map a new direction for relations with the company. Increasing solidarity in the bargaining unit and including better contract language in the new agreement were key considerations during the program. Local 66 members at Badger Meter manufacture water meters for residential and commercial usage. The current contract expires October 31, 2016.